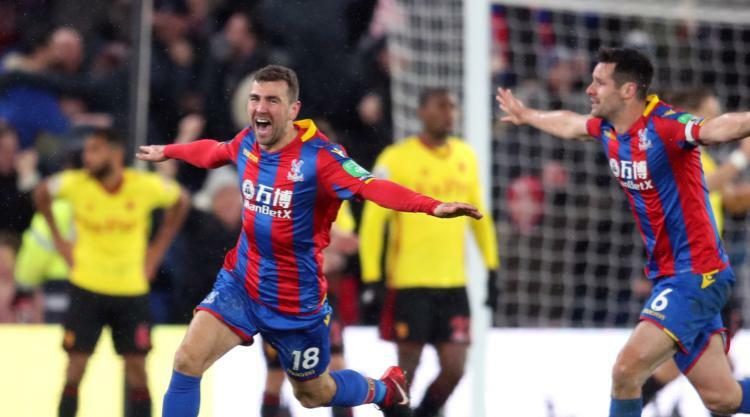 Crystal Palace's James McArthur has praised the team's "remarkable character" after their latest comeback lifted them out of the Premier League's bottom three. And he also revealed the extent to which Roy Hodgson's calming influence has inspired their revival following defeat in their first seven league games of the season. McArthur's stoppage-time finish secured a 2-1 victory over Watford, who had led through Daryl Janmaat's third-minute header until Bakary Sako scored in the 89th minute, shortly after Tom Cleverley's red card. Since Hodgson's appointment Palace have also earned a draw with West Ham and a victory over Stoke in the final minutes, while they were only denied a win against Bournemouth when Christian Benteke missed a late penalty. Each time they have shown a resilience that had been absent before the manager's arrival, when conceding the first goal would often expose a lack of confidence. McArthur said: "The character to keep coming back is remarkable. "That is what it is going to take. To come back and get three points is incredible and it is an amazing feeling in that dressing room. "It is a massive win. You look at some of the big goals we have scored in the last couple of minutes which has kicked us on every time. We score last minute and it keeps the run going; West Ham we looked like we were going to lose and we drew. "Against Stoke you think we will take a point and then we go and win. (Against Watford) you think we have lost and we go and win it. "Five or six games ago we looked adrift. We should have beaten Everton, West Ham, we should have won against Bournemouth. But we are turning those losses into draws. Every point is so important. "The manager does not panic. That is amazing for us. The moment that made me realise how experienced he was was after we lost away to Manchester United and Manchester City. "He was still the same person he was before those games. Totally chilled, but knew the job was going to be hard. From there we have turned it right around." Benteke was on Saturday widely criticised for defying team orders to take Palace's late penalty ahead of Luka Milivojevic, but on Monday he apologised to his team-mates. "It takes a lot to stand up in front of the boys and say what he did," said McArthur. "Christian made a mistake, but everybody is going to throughout the season. It has been blown up because it was last minute, but we all want the same thing. He felt confident, he did not score, we move on." Watford manager Marco Silva criticised his players for not handling the threat posed by Wilfried Zaha, who created Palace's two goals. "We should have managed the match in a different way in that moment," the 40-year-old said. "Zaha created two moments, but, even then, we were in a good moment. One against two. We should have done things different. We were in a position to do that."